Warning: Long post. I have thoughts. I had zero expectations entering the movie theater. I didn't read any reviews about it because I didn't want to. I hoped for the best, feared for the worst and (truthfully) was glad someone else was footing the bill for my movie watching experience. Naturally, the hope for any producer is that you will love their movie and will want to tell everyone that you meet that they should see their movie. Well, well. Downing and Burnett appeared on the screen both before and after the movie screening, sharing their hopes, beliefs and dreams for this film. It is their deep desire that Christians will see this film as being a great tool for evangelism. 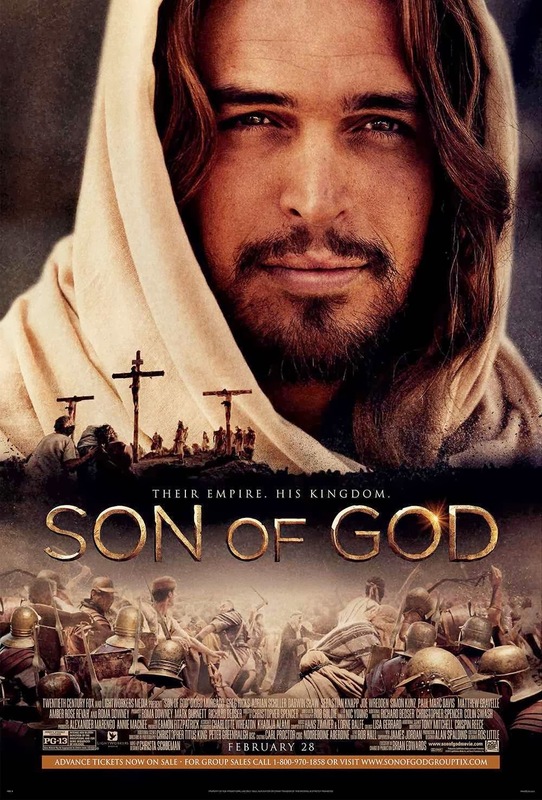 They spoke of the fact that this is the first time in 50 years that the life of Jesus has been portrayed on the big screen and so it is an incredible opportunity to minister to a new(er) and young(er) audience of movie goers. They point out that while many people may not read the Bible to find out who Jesus is, they will agree to go see a movie about Him. All of this is, to me, cringe-worthy and true! I am also compelled to admit both before my viewing and afterwards that God can use anything He likes to get a hold of a sinner and draw them unto Himself. He can even use this movie. As He is God, He can do whatever He likes. We had to drive over an hour away to attend the screening and the drive back home gave us plenty of time to discuss our opinions of the film. I'll spoil the rest of my review right here for you and tell you that neither of us were big fans. I'll explain why if you choose to read further. First, let me say that Jonathan's and my opinions are likely to be in the minority here. As Downey and Burnett say, they have been working with many "world faith leaders" in working to promote this film. These leaders include Rick Warren and even Mark Driscoll (which we find a little bit odd). If Downey and Burnett had been present, I was planning to ask them how they go about choosing which faith leaders to ask about their film. I also wondered if they had consulted with any seminaries or theologians in the making of the film. That seems to be to be a reasonable and useful thing to do. Can anyone tell me what's missing from that? I'll fill you in. The second half of the verse is missing which states: "no man can come to the Father except by me." If you read the scriptures you can quickly and easily see that Jesus spends His entire earthly ministry pointing people to God the Father. He himself is God's son, perfect and wholly God and perfectly wholly man. Although He is God, His mission (if you will) is to seek and save the lost, pointing them to God who can offer them forgiveness, belonging, and everlasting life. The Film Jesus spends the whole time pointing only to Himself, leaving out any reference to the fact that He is on earth to do the will of His father (God) who sent him (John 4:34). Jesus is, in true fact, the way, the truth and the life -- to point us to the Father. Another oft repeated verse in this film was, "Take, eat, this is my body." (Matthew 26:26) Any teacher of scripture will tell you that you cannot just look at one verse and build an entire thesis on that (or, in this case, a movie). Even as a Christian, I found myself sitting and thinking that the partial phrase, "This is my body" sounded empty and strange. I didn't have to work at attempting to hear that one verse from the stand point of a non-Christian. I asked myself why on earth he was ripping bread up and calling it His body (?). The on screen disciples looked as confused as I felt. (This is when you can insert your argument about how historically they would have been confused.) But I think you can tell a better, more complete story if you have your Film Jesus follow up with verses 27 and 28 which explain a few things more completely: the bread represents His body, the wine represents His blood, His blood was poured out as a forgiveness of our sins. That is a crucial point to cover. The Gospel message is not delivered in this film at all. There is no talk of a Holy God the Father. There is no talk of our need to be with Him and our inability to do that in and of ourselves because of sin. There is no explanation of what Jesus is the way to, the truth of and of what life He means for us to have in Him. There is no forgiveness asked for in the film (excepting one time when Matthew the tax collector sheds some tears and asks that God have mercy on him) and absolutely no relevance (as to our sin) given to Jesus' death on the cross. Speaking of Jesus's death on the cross - many people will recall the movie The Passion of the Christ which details the crucifixion in quite the vivid way. There are many raging opinions about that film and those arguments are likely to resurface as relates to Son of God as well. Although Son of God is purported to be about the entire life of Christ, it does not deliver on that promise. You see about 2 minutes worth of Jesus' arrival and birth to Mary, a various smattering of earthly miracles (whichever the producers wished to include), some brief snippets of a parable or two and a very long crucifixion. It's not as long and drawn out as The Passion but it is still quite lengthy. I don't really have an opinion on whether or not we should be viewing a re-enactment of the crucifixion on screen. What I do think we need to do is to take great care of is that it's not gratuitous for the sake of showing a lot of blood. Because the Gospel message was completely lacking in this film (again I reference that there was no discussion of sin, the need for repentance and the need to believe in the Lord Jesus Christ for salvation from God) then the crucifixion, I would think, would be somewhat baffling to a non-believer resulting in unintended gratuitous violence. WHY is Jesus dying? All I can tell from the film is that the Jewish leaders didn't like him and got a bit sneaky in getting the Romans to dispose of Him on their behalf. His death is more a matter of politics, according to Son of God, than because of the need for sacrifice in order for our ability to have a relationship with God to be restored. Because of the lack of the Gospel message, the point of the crucifixion is lost and I would deem the violence to be unnecessary. C.S. Lewis' question of who God is kept popping up in my head as I watched this film: was Jesus a lunatic, a liar, or was He telling the truth about who He was? If I were a non-Christian trying to answer the question with this film, I'd go with option 'A'. I would say that Jesus was a lunatic; He couldn't be anything but according to this portrayal. Between his slow speech patterns, the constant and continuous (i.e., totally creepy) smile that was on his face, his soft spoken chiding people into calling him "Messiah", His ethereal glances towards the sky when speaking about a kingdom not of this world, I'd simply conclude he was a nice - but totally crazy - guy. Also, I would be tempted to conclude that He didn't seem to have much worth saying during his time on earth. I'd assume He was just another revolutionary who got the short end of the stick thanks to some corrupt politicians. The film leads me scratching my head wondering why we'd fuss about a Jesus like the one portrayed on film? Producer Mark Burnett has claimed that this is a Jesus for a new generation. But I don't think we need a new Jesus for a new generation. I think we need the Jesus of scripture for every generation. That Jesus told us that we sinned, but that He was salvation. He gave real hope because He gave us the way for all of us, all over the world and throughout all time, a way to be with God. We need a Savior and trying to soften that message with a nice, kind, quiet Jesus is not going to do anyone any favors. We must repent of our sins and believe that Jesus is, in fact, the holy lamb and Son of God who died for our sins so that we can come boldly to the throne of grace, accepting forgiveness and worshipping Him for Who He is and for what He has done. - At the death of Lazarus (who we were never properly introduced to) Martha appears before Jesus in tears and announces, "My brother Lazarus is dead." Jesus does not respond to her in any way but to say, "Take me to the tomb." Upon arrival, He enters into the tomb with Lazarus and begins preaching to the dead body, promising that those who believe in Him (Jesus) should never die. Then Jesus kisses Lazarus's head causing Lazarus to jolt back to life. Read the real story here. - The film Jesus calmly smiles at Caiaphus and tells him that in three days the temple will be destroyed and no stone will be left standing. He calmly walks away (with the same smile on his face). He appears to be calmly and happily taunting Caiaphus when he does this. (As Jonathan said, "Tickle, tickle!"). Read the real story here. - When film Jesus enters the temple before passover, He is distressed to see the money being changed for sacrifices. He knocks over three tables in a distracted manner, then says with a moan, "it is written that My house is to be a house of prayer." Tears fall from His eyes. Read the real story here. The Bible is very clear that we are not to add to or take away from what scriptures teach (Rev. 22:19). Deciding to make a film about Jesus's ministry, life and purpose would be - I would think - a very terrifying thing to do. You should feel the pressure to get the story accurate. There should be no softening of any of the hard, fast truths in some attempt to make God more appealing to man. Don't pick and choose what you think a non-believer might want to hear. You cannot sway a person or move their heart towards God; only God can truly change us. The producers said at the conclusion of the film that they prayed that this movie might open the door to someone's heart just a little bit so that God could come in and work in them. (I nearly passed out on the floor at this point.) Please don't misunderstand me - God uses us to spread His word and that's a fact. He calls us to work with Him to spread the Gospel message. But He isn't waiting for us to get the door open for Him. He can crash through any number proverbial walls all on His own. (Again, He can do this because He is God.) What He doesn't need is for us us to make sure His message sounds palatable to our unique generations. Our call is to be always faithful to tell the truth about what the scriptures teach about both God and ourselves. That is all. The Word of God is living and active, sharper than a two-edged sword. It can do it's own work. Never try to change it, people. Stick with the facts and believe in the Son of God. He IS who He said He was. That means we've only to tell people exactly Who that is and exactly what that means. We are not directed to make any changes and we should not think ourselves so important or vital that we give in to temptation to change the story up. Telling the truth will do the world a far greater service than anything else. And when you do, you don't need to worry about the results: they are entirely in God's hands. This movie is in God's hands. He will do with it whatever He likes. So I'll not worry about it. But I'm also not going to be recommending it. We may have never talked in real life, but I could HEAR your passion! What a solid movie review. Sounds like lots of good discussion of a lacking movie. Thanks so much for your take on this movie. I had a problem with the little bit of the Bible series that I saw. Not a fan of watered down messages. I don't go to movies very often. This one won't be one I see. Thanks so much for the review and the true definition of what Christian evangelists should e including in their message. While I think that Downing & Burnett have their hearts in the right place, their theology is a bit off base. The problem is SIN. Nobody wants to talk about it anymore because that would not be politically correct and someone might find it offsensive. Funny thing is you can talk with people outside the "western" culture about sin and they accept that They do sin and there will be an accounting for it with impact in this world and the next (world or life) depending on their religion. Excellent well-thought-out points. I have no desire to watch it. The absence of sin in the "gospel" message is probably my pettest of peeves. I hear so many people say "Jesus died on the cross for you" and it frustrates me to no end. Yes, it's true. Jesus died on the cross for you. It's also true that an American patriot died in War of Independence for me. Just because someone died for me doesn't mean I should worship them or surrender my life to them. What's missing is that Jesus Christ died on the cross to bear the wrath of God for my sins. He bore the wrath that I deserved. He bore the wrath that I absolutely could not bear up under. That Jesus died is one thing. That He (the perfect and spotless Son of God) bore the wrath of God on the cross for my sins (committed in rebellion to Him) and extends me pardon is a totally other thing. Hadn't heard of this yet and appreciate your review, especially your quote about needing the Jesus of Scripture for every generation. Makes me cringe to think of how this movie could be received! Jonathan and I DVRed the TV series on the Bible recently, but I didn't watch much of it. Too much was changed for my tastes. I don't like Biblical fiction, and I guess my thoughts are the same about movies. "I don't think we need a new Jesus for a new generation. I think we need the Jesus of Scripture for every generation." Amen. Thanks for the review. When I read that churches were buying out theatres I began to question the depth of the film. It is much easier to convince people to accept religion than to be honest about their sin and a need for a Savior who took the penalty (a judicial act without any substitution) they (I) deserved and yield to Him every will and whim of my life. Jesus was never about philosophy but a "relationship" with His Father that He enjoyed immensly and desires for us the same. A truly unadulterated film about the life and message of Christ would not make it to far. Too convicting and offensive to our lax morality of today. God may, I agree, use this in some lives but His method is still the same, you and me, day after day in every walk of life living out the message with our words and actions. We have a big job and no time to waste. Thank you for your detailed review. It was good and I too would have been troubled by what the film both added and what it left out. I agree with the Bible verses you used to defend your critique. We don't need a new Jesus for this new generation. That is the devil's lie. We need the Jesus of the Bible. I don't think I will go see this movie, I wasn't planning on going anyway as it bothers me so to see the Bible maligned in anyway. Doctrine does matter. We are to love our Lord our God with all our heart, our mind, and our soul. Too many Christians today focus on the heart, but overlook the mind. That's my opinion anyway. God bless. The Bible series also had untruths and so i was skeptical too about Son Of God movie, but I could not find even one neagative critique about it until this one. Thanks for opening my eyes.